The third volume in the complete works of Fayrfax contains two pieces with very specific connections for the composer. 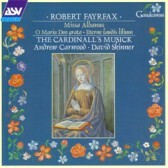 The Missa Albanus takes a melody from the office of S. Alban and may well date from the time when he was resident at S. Alban’s Abbey in Hertfordshire. Whilst the sophisticated setting of Eterne laudis lilium was commissioned by Elizabeth of York, wife of Henry VII, just a short while before her own death. It is unique in setting the genealogy of Christ using the female line of descent, and takes the opportunity to emphasise the name ‘Elizabeth’ in the second part of the antiphon.